Dr. Kwok Leung joined the National Foundation for Cancer Research (NFCR) as a consultant in 2003 and was promoted to Controller in 2008. He oversees three supporting functions of NFCR’s operations: accounting and reporting, compliance, and human resource and office administration. 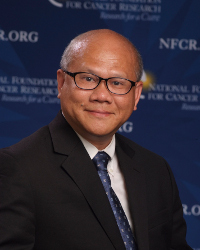 Prior to joining NFCR, Dr. Leung was a faculty at the Catholic University of America, and at the University of Maryland, College Park, teaching accounting at both undergraduate and graduate levels. His research interests were management accounting and executive compensation. He also served as consulting staff and researcher for the World Bank and U.S. Department of Transportation. Dr. Leung received his B.B.A (Hon.) from the Chinese University of Hong Kong and his Ph.D. from the University of Maryland, College Park, majoring in accounting and minoring in finance and statistics. He was a licensed CPA in Maryland. Your ticket for the: Kwok Leung, Ph.D.